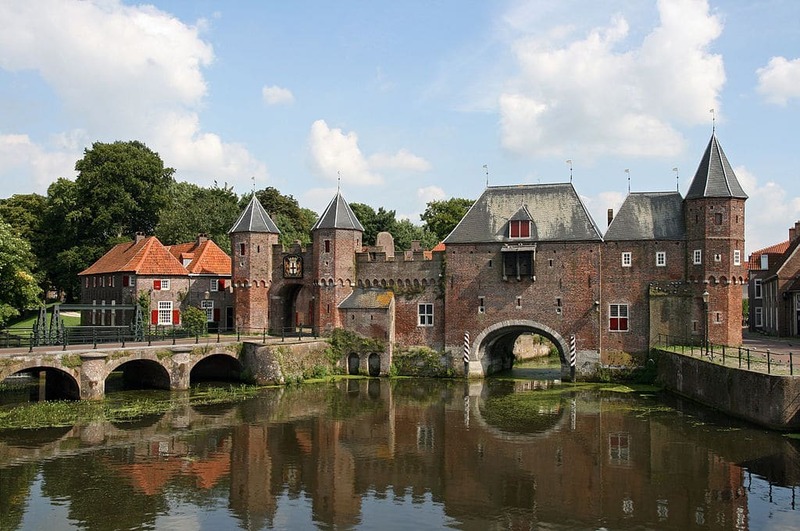 Amersfoort is a very historic and attractive city to the west of Amsterdam. It has many fine medieval buildings that are well maintained. It is a busy place with a population of just under 150,000 people, but the town centre is easily explored on foot, with most of the main attractions being easily within walking distance. The railway station is one of the busiest in Holland with several tracks converging on the area. Amersfoort has had people living in and around it for a very long time. Archaeologists have found remains going back as far as 1,000BC although these were probably people that were constantly on the move, following the hunting, and moving with the seasons to gather the local produce. The first villagers probably settled Amersfoort around the 11th century, as it was a strategic location near to a fort in the river. This would very likely have been important for trade as well as travel, as any travellers going that way would have had to go through the village to cross the river. Being in such a good trading location the village grew quickly and prospered and soon more permanent buildings had been established around the central area that was later to turn into, what would be known as the main square, where the Bishops set up the local court so that they could hold sway over the area. The town was given a charter to become a city in the late 1200’s and soon work was started on it’s city walls. But these had to be rebuilt further out and expanded over the next 150 years as the new city grew and prospered. In the middle of the 15th century work was started on the new church. this lasted well and the town grew more until in1787, there was a huge explosion in the church, which destroyed most of the main building and just left the tall, at just under 100m, tower still standing. Amersfoort had also become an important centre of trade for tobacco and textiles. The railway was built in the city in the late 19th century and a large army garrison was established there. In the early 20th century, trade went down and the city began to suffer from depression. In the Second World War the city was the site of a huge battle between the local army and the occupying German forces. In the wartime about half of the 700 Jewish population were taken and killed by the German army. After the war Amersfoort prospered again into the lively city that is there today. Amersfoort is a well placed modern city with good transport links that is very easy to get in to and around. If you arrive by plane, you will fly into Amsterdam’s Schipol Airport. The airport is one of the busiest in Europe and has many arrivals from not only the EU, but from all over the world. 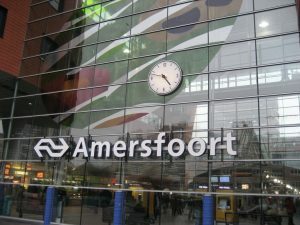 When you arrive at the airport the easiest way to get to Amersfoort is by train. There are about 2 fast trains every hour that will complete the journey in about half an hour. There are also various slower trains that will take a bit longer if you are not in a hurry. Amersfoort has excellent rail connections, being built on an important junction. There are also good connections from Utrecht and Arnhem. If you are travelling from Germany there are three trains a day from Berlin and one from Hanover. If you are driving, you will need to take the A1 from Amsterdam or the A28 from Utrecht or Groningen. There are also long distance buses from Wageningem, HIlversum, Harderwidjikand Apperdoorn. The central tourist part of Amersfoort is very compact and the easiest and most convenient way to travel around the old city is by bicycle this way you will avoid all of the hassle of parking, or finding buses and waiting around. It is easy and cheap to hire bikes from shops around the city. If you would rather take the bus there are plenty and it is a good reliable system. If you would like to go by taxi there are many taxi ranks around the city. if you would rather book one to meet you, you can do so by telephone at, Taxi Central Amersfoort, +31 33 887 7600 , or, Taxi Boute Amersfoort, +31 33 258 8849. Museum Flehite is an interesting museum that is in a row of old houses,(16th century) and has an interesting collection of both artefacts and works of art that are relevant to the city and the surrounding areas. Mondriaanhuis is an art gallery and museum dedicated to the life and works of the artist Piet Mondriaan in the house where he was brought up. The Lieve Vrouwe tower is all that was left after the original church was blown up accidentally. At just under a hundred metres high, if you make the effort to climb the tower you will be able to get some spectacular views over the city. Amersfoort Zoo is much more than normal zoo. As well as all of the animals that you would expect to find in a zoo, there are exhibits such as the dinosaurs in the wood and the Rijk der Reuzen where you can meet the elephants. 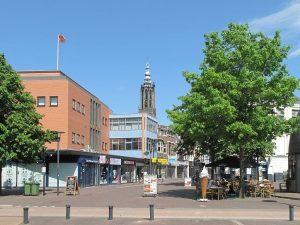 Amersfoort is a great city to go shopping in, with everything, (and everyone) catered for, from large international department and clothing stores, to small local arts and crafts establishments. The main shopping center is called the Sint Jorisplein and this houses all of the major shops and stores, but if you go for a wander down the side streets there are many small independent shops. The Pastinaeck Is a simple, yet stylish restaurant serving upmarket cuisine. Their dishes are mostly relevant to the local area, with a lot of use made of local produce and , as they put it, forgotten vegetables.The Mayflower English Tea Rooms are a great favourite with tourists for their traditional English cream teas. Amersfoort is a great city for the tourist. It has a well preserved old town with many medieval buildings and great shopping, entertainments and food.